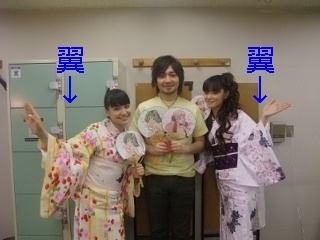 According to a blog entry by Aya Endo, voice actress of Sheryl Nome in Macross Frontier, cast members Megumi Nakajima (Ranka Lee) and Yuuichi Nakamura (Alto Saotome) were at Asakusa for a Macross Frontier Fans Club event. 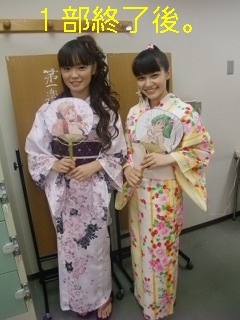 Aya Endo and Megumi Nakajima wearing Yukata's or summer kimono's. Compared to the silk version of the kimono's which can have prices as high as millions of yen, Yukata's are comparably cheaper since they are made of cotton. The two look very cute in their national dresses. Megumi Nakajima, Yuuichi Nakamura, Aya Endo. Photo of the very famous Love Triangle that is staple to all Macross series. Aside from that, the other Macross signature components found in any Macross series are: Mecha, Music, Space Opera... yeah!